The cabin is 2017 new construction decorated with a comfortable, rustic, country decor. It is located at the end of a private road over looking Okemo within the Village of Ludlow. 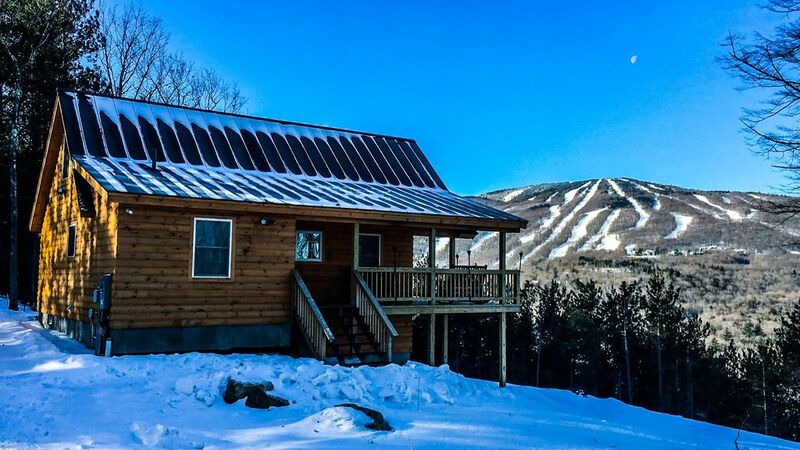 The views of Okemo and surrounding mountains as well as the sunsets are unequaled. The upper level of the cabin has 2 bedrooms (Queen beds), a loft (Queen bed), full bath and open kitchen living area including sit down dining set seating for four (expandable leaf built into table and 4 additional folding chairs available). Relax with family and friends enjoying the cozy gas fireplace and large flat screen smart tv. The lower half of the cabin features a walk in heated basement to store ski/ snowboard equipment, boots, etc., full bath and family/kids room with additional bedding (bunk beds and queen bed), bean bags and large flat screen tv. The cabin has free Wifi, a fully equipped kitchen, washer/dryer, and bed and bath linens. Enjoy the incredible views, beautiful sunsets, night time star gazing, and grilling (large gas grill) on the wrap around porch lit by tiki torches. Activities/Attractions During Winter Months: Whether your intentions are to come for the prime skiing in the winter, the fall foliage or a spring or summer retreat, you will find everything you need for a great family vacation. Okemo Mountain offers 110 trails for all experience levels, and Okemo's Jackson Gore resort is located just minutes from our cabin. In addition, try out more than one mountain; a 15 to 30 minute drive brings you to Killington (just 12 miles north), Stratton, Bromley and Magic Mountain. Ludlow offers picturesque trails for cross-country skiing and snowshoeing. Likewise, you will find the sledding, snowmobiling, and ice-skating exhilarating and enticing. At local shops and stores you will find excellent cheeses, fresh produce, home baked breads and world-renowned Vermont maple syrup. In addition, the town has a wide assortment of dining establishments, from small breakfast/lunch diners to fine restaurants within historic estates and inns. Activities/Attractions During Warmer Months: During warmer weather, enjoy a round of golf at the Okemo Valley Golf Course, or quiet fishing, swimming, boating or canoeing on one of the many rivers and lakes, including Lake Rescue just 15 minutes from cabin. The area boasts of woods with quite paths to hike or bike through. Special area attractions include Buttermilk Falls and Mountain Fire Tower. The Sunset Cabin was just awesome for our trip with our granddaughters and family. It was cozy but yet had plenty of room for the 6 of us. The kitchen has pretty much everything you need for cooking and all the appliances are brand new. We so enjoyed our visit and would definitely recommend this property to anyone who needs a great get-away place in Vermont! Amazing views of Okemo mountain!!! Very clean, cozy house in a great location. So close to mountain maybe a seven minute drive. Would definitely book again. Really a wonderful property--everything is quite new including the house and all the furnishing. Spectacular views of Okemo slopes. Super clean. Only a short drive to Okemo. Wonderful, very receptive property host. We had 18 inches of snow that got plowed quickly (twice in one day!). Great heating/structure that kept the house cozy warm despite -10 F temperature! Thanks for choosing our cabin and for submitting your review! still did not get refund after 2 weeks. deducted one star for this. I don’t have your damage deposit. VRBO holds your damage deposit and refunds you directly. It is scheduled to be refunded 1/20/19 which is 2 weeks from your date of departure. I hope you enjoyed your stay and thanks for choosing our cabin! Wonderful mountain cabin with spectacular views!!! The cabin is brand new. It has the most beautiful views. The owner was very helpful. Everything from plates, utensils, towels were fully supplied. Beautiful cabin with deer coming close to the driveway. Very short, scenic drive to Okemo. Highly recommended.